Cononaco Bameno-Ecuador(South America) October 27th-2012-EXCLUSIVE FEATURE STORY. The Huaorani, also known as the Waos, are native Amerindians from the Amazonian Region of Ecuador (Napo, Orellana and Pastaza Provinces) who have marked differences from other ethnic groups from Ecuador. They comprise almost 4,000 inhabitants and speak the Huaorani language, a linguistic isolate that is not known to be related to any other language. Their ancestral lands are located between the Curaray and Napo rivers, about 50 miles (80 km) south of El Coca. These homelands – approximately 120 miles (190 km) wide and 75 to 100 miles (120 to 160 km) from north to south – are threatened by oil exploration. In 1993, the Huaorani, and Quichua indigenous people, filed a lawsuit against Texaco oil company for the environmental damages caused by oil extraction activities in the Lago Agrio oil field. After handing control of the oil fields to an Ecuadorian oil company, Texaco did not properly dispose of its hazardous waste, causing great damages to the ecosystem and crippling communities. And recently, an US oil giant, has been fined $8.6 billion, for causing devastating pollution in large parts of the Ecuadorian Amazon basin, where Huaorani tribe lives. The oil firm Texaco, wich merged with Chevron in 2001, had been accused of dumping billions of gallons of toxic waste into unlined pits in the Amazon’s rainforest and rivers. Tribes indigenous to the area, like the Huaorani, have campaigned for almost two decades against the firm’s actions, saying that the poisonous waste has increased cancer rates, killed wildlife and contaminated water.In the past, Huaorani were able to protect their culture and lands from both indigenous enemies and settlers but the fighting against the multinational oil company, still goes on. In the last 40 years, they have shifted from a hunting and gathering society to live mostly in permanent forest settlements. In traditional animist Huaorani worldview, there is no distinction between the physical and spiritual worlds, and spirits are present throughout the world. The Huaorani once believed that the entire world was a forest (and used the same word, ömë, for both). The Oriente’s rainforest of Ecuador, remains the essential basis of their physical and cultural survival. For them, the forest is home, while the outside world is considered unsafe: living in the forest offered protection from the witchcraft and attacks of neighboring peoples. The Huaorani believe the animals of their forest have a spiritual as well as physical existence. They believe that a person who dies walks a trail to the afterlife which has a large anaconda snake lying in wait. Those among the dead who cannot escape the snake fail to enter the domain of dead spirits and return to Earth to become animals, often termites. This underlies a mix of practices that recognize and respect animals, but does not shield them from harm for human use. Hunting supplies a major part of the Huaorani diet and is of cultural significance. Traditionally, the creatures hunted were limited to monkeys, birds, and wild peccaries. Neither land-based predators nor birds of prey are hunted. Traditionally there was an extensive collection of hunting and eating taboos. They refused to eat deer, on the grounds that deer eyes look similar to human eyes. While a joyful activity, hunting (even permitted animals) has ethical ramifications: “The Huaorani must kill animals to live, but they believed dead animal spirits live on and must be placated or else do harm in angry retribution.” To counterbalance the offense of hunting, a shaman demonstrated respect through the ritual preparation of the poison, curare, used in blow darts. Hunting with such darts is not considered killing, but retrieving, essentially a kind of harvesting from the trees. Spearing wild peccaries, on the other hand, is killing and is practiced with violence and rage. While never hunted, two other animals, the snake and the jaguar, have special significance for the Huaorani. Snakes are considered "the most evil force in the Huaorani cosmology", particularly the imposing (though nonvenemous) anaconda, or obe. A giant obe stands in the way of the forest trail that the dead follow to an afterlife with the creator in the sky. Here on earth, snakes are a bad omen, and traditionally killing them is considered taboo. Plants, especially trees, continue to hold a complex and important interest for the Huaorani. Their store of botanical knowledge is extensive, ranging from knowledge of materials to poisons to hallucinogens to medicines. They also relate plants to their own experiences, particularly that of growing. Among trees, certain kinds are auspicious. Canopy trees, with their distinctly colored young leaves and striking transformation as they mature to towering giants, are “admired for their solitary character … as well as for their profuse entanglement” with other plants. Other significant trees are the pioneer species of the peach palm (used for making spears and blowguns, as well as for fruit), and fast-growing balsa wood, used for ceremonial purposes. Peach palm trees are associated with past settlements and the ancestors who live there. The Huaorani notion of time is particularly oriented to the present, with few obligations extending backwards or forwards in time. Their one word for future times, baane, also means "tomorrow". Spears are the main weapons of the Huaorani culture used in person to person conflict. Their main hunting weapon is the blowgun. These weapons are typically from 3 to 4 metres long. The arrows used are dipped in curare poison, which paralyzes the muscles of the animal which is hit with it, so that it cannot breathe. Kapok fluff is used to create an air-tight seal, by twisting the fibers around the end of the dart or arrow. 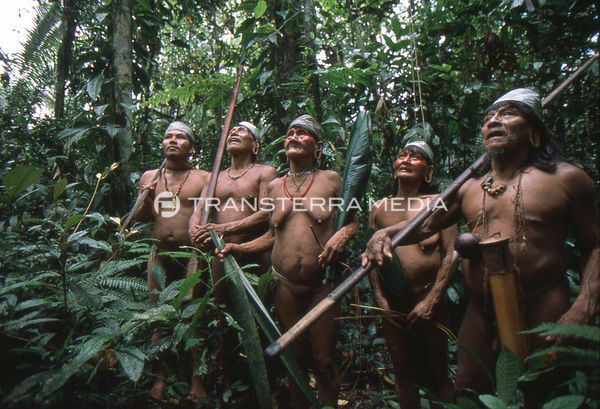 The pictures shows some huaorani , waiting monkeys for hunting.